Today’s picture from Glacier National Park is a view along the Aster Falls Trail near Two Medicine Lake campground. In a future where the conflicts of Earth have translated out to the stars, Choi has a problem. He’s a loyal and competent tank commander in a conflict on a iceball of a world between a large American armor force and a Chinese force reinforced by their under-equipped and under-gunned North Korean allies who are at best, expendable. The problem is, *he’s* the North Korean. Oh, and his tank has broken down, his unit decimated, and the Americans are coming. Oh, and his politically connected and very dogmatic crew members appear to have been more selected for loyalty to the North Korean state rather than competence. Choi is not having a good day. And if he is not careful, it’s going to be his last. Such is the matter of A People’s Army, a military short story by T.C. McCarthy. 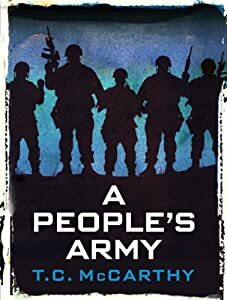 Better known for his Germline/Exogene diptych (which I have not yet read), A People’s Army runs from the above premise and unspools the conflicts, both the technical and the social ones that Choi faces just to survive in a war he doesn’t understand. The role reversal of the usual characters is a nice touch, and the characters felt authentic and well-realized. Choi makes an appealing protagonist, especially that he is a character that doesn’t fit the usual molds one might find in a military SF story. A loyal albeit cynical member of a North Korean military? I’ll be darned if I can think of a character I’ve read lately remotely like him in that regard. In addition, the action scenes are well done, and the entire premise and scenario reminded me of the Eastern front in World War II, with the North Koreans in the role of one of the hapless minor allies of the Germans, facing opposition stronger than they by far, and being deliberately used as fodder. The sense of impending doom, like a countdown clock, is also well done. My complaint with the story is that I never quite bought the premise as a serious bit of speculation. I couldn’t imagine a sequence of future history that plausibly would result in this scenario taking place. It is the largest, the most glaring but really the only flaw I can find in the story. At some point, I will need to read Germline, and see what McCarthy can accomplish at novel length. Today’s picture is Spoonbridge and Cherry, with a modified monochrome palette to allow saturation of red. What do you think? Lower Falls, Grand Canyon of the Yellowstone, a photo by Jvstin on Flickr. Backlash against The River, of course. Let’s see if when the other big publishers start to follow suit. I’m pretty sure they have no choice if they want to survive in this ebook world. Sunset over Yellowstone Lake, a photo by Jvstin on Flickr. Today’s picture for you is of sunset light over Yellowstone Lake, Yellowstone National Park. Ganymede and the Eagle, a photo by Jvstin on Flickr. Today’s picture for you is of Ganymede and the Eagle by Bertel Thorvaldsen, at the Minneapolis Institute of the Arts. Me at the Headwaters, a photo by Jvstin on Flickr. Today’s picture to celebrate the birthday of Itasca State Park is a picture of me at the Headwaters of the Mississippi River. "Dominos" sign on bunker door, a photo by Jvstin on Flickr. Falls, a photo by Jvstin on Flickr. Today’s picture for #waterfallwednesday is from my Pre-DSLR days. This is Athabasca Falls in Jasper National Park, Canada.